Today I really wanted to talk about the essential products you should definitely take away with you this summer when you go on holiday! Before I start going into things, I just want to point out that this post isn't sponsored, I went away on a work trip and this was like a little gift that was in my hotel and I just thought everything was perfect so I wanted to share with you guys. And if you're protecting your skin then you have to protect your lips too! There are a lot of good lip balms out there with SPF and this Korres Mandarin Lip Butter smells amazing but it also adds a little bit of colour to the lips too, so it's a handy little product to have in your bag. Something I always forget but alway end up needing are blister pads, it's because your feet aren't used to the new sandals yet and i literally blister all the time, in fact when I went to Budapest recently I ended up going home with 3 cuts on my feet, rather dramatic! Compeed Blister pads are something I've never tried before but I definitely think they are a great idea! I think you should always take some treats on holiday such as a Clay mask and Vita Coconut Oil! Let's face it when you go on holiday you have absolutely loads of time to just relax and because you're in the sun all day a little 10 minute face mask would be perfect on your skin to draw out any impurities. I think every beauty blogger knows the benefits of coconut oil but I definitely think this would be a perfect treat for your hair because it will dry out so this will nourish it and the coconut scent is perfect for a holiday. 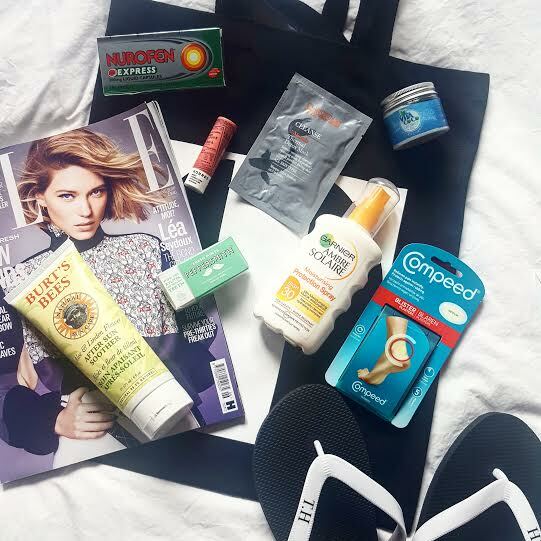 No holiday would be complete without a Tote bag, flip flops and a good magazine to read by the pool, I do carry mints around with me for obvious reasons but I also think that paracetamol Nuerophen tablets are handy too, ya know just in case you've had one too many the night before.